Welcome to the Catch-22 fixture. Arsenal's 2-2 draw with PSG on matchday five gave the tiebreaker to the French club as we approach the final group stage match. PSG only have to match Arsenal's result to win the group and they host Ludogorets, playing what is, on paper, the easiest fixture of the group, a fixture Arsenal won by six back in October. So, if you're Arsenal, how to you prepare for this match? Do you rest some guys or go for it? Do you risk injuries in a match that could prove academic? Arsenal have three league fixtures in eight days after this, including a visit from Stoke and difficult road fixtures at Everton and Manchester City. How much can you really prioritize this European trip when PSG holds all the cards? You're damned if you do and damned if you don't, honestly. Basel, on the other hand, have everything to play for in terms of Europa League qualification; Ludogorets have the tiebreaker right now, as they also drew both of their meetings; the Bulgarians got a 1-1 draw in Switzerland and drew 0-0 at home, giving them the away goal. Therefore, Basel must better Ludogorets's result in Paris. That all means that, out of the four, the club with the least control over its own destiny is Arsenal. So, who would you bring on the plane? The good news is, since this is a road fixture, we know who's on the plane (so you might wonder why I even asked the question.) Arsenal took a strong squad with them to Switzerland with Arsène Wenger quoted as saying, "I keep the group together." There could still be plenty of rotation, considering Arsenal's relative depth in midfield. We know that Francis Coquelin is ineligible as he picked up an accumulation ban after his booking on matchday five. That should leave a midfield axis of Granit Xhaka and Mohamed Elneny, who performed well together against Bournemouth recently. That is, of course, if the Gunners utilize the strongest lineup available to them. Per Mertesacker, Hector Bellerín, and Olivier Giroud all returned to training on Monday; they're listed in there in the order of how long they've been out from longest to shortest. It would be a tremendous boost for Arsenal if Bellerín were available for those tricky road fixtures next week. Danny Welbeck should be back in the fold by the end of this month or beginning of next month as well, which only leaves Santi Cazorla and Mathieu Debuchy as long term absences. Predicted XI: Ospina, Gabriel, Mustafi, Koscielny, Gibbs, Xhaka, Elneny, Ramsey, Walcott, Özil, Pérez. Center back Manuel Akanji has been out since March with a cruciate ligament injury. Jean-Paul Boëtius has missed the last three games with a knee problem, while Kevin Bua has been out since the end of October with a muscle injury. Andraž Šporar had had an adductor injury, but made an appearance off the bench at the weekend. Predicted XI: Vaclík, Lang, Suchý, Balanta, Traoré, Xhaka, Bjarnason, Steffen, Delgado, Zuffi, Doumbia. Arsenal's long unbeaten run in all competitions might be over, but it's worth noting that both of their losses this season have been at home. That means Arsenal have not lost on the road since they visited Camp Nou in the second leg of last year's European Round of 16. That was on March 16, meaning the Gunners are now unbeaten in their last 14 road games (10 this year, four last year.) Arsenal's unbeaten run in the Premier League is now 13 games since opening day, leaving them in sole possession of second place after Manchester City and Liverpool both lost last weekend. 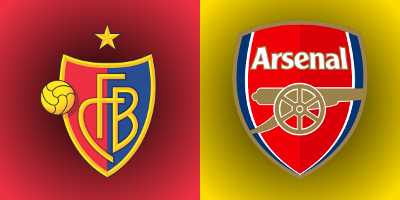 If you had excluded Champions League losses to Arsenal and PSG, Basel were unbeaten on the season as a whole going into this past weekend; on Saturday, however, they lost 3-1 at Young Boys to suffer their first domestic defeat of the season. Still, with 17 games already played, Basel are 12 points clear at the top of the table. Domestically, FC Thun is the only club to get a point at St. Jakob-Park this season, when they picked up a 1-1 draw on October 1. Basel needed a 90th minute goal from substitute Davide Callà to salvage the point. Arsenal won the reverse fixture 2-0 at the Emirates back in September in what was the first ever competitive meeting between these two clubs; Theo Walcott scored in the 7th and 26th minutes to give Arsenal the two-goal cushion and David Ospina made two saves to preserve the clean sheet. Arsenal could have scored a few more in the match but lacked clinical finishing at times; since overall goal difference won't come into play in deciding the group, that point is moot. Historically, Arsenal have only visited the country of Switzerland twice for competitive matches and the Gunners have won both: 1-0 at Thun in the 2005 group stage, via a late Robert Pirès penalty, and 2-0 at Grasshopper in the first leg of the second round of the 1971/72 European Cup, with goals from Ray Kennedy and George Graham. Arsenal won that tie 5-0 on aggregate, but then lost the quarterfinal to Ajax. In 11 home matches against English sides, Basel have won five, lost four, and drawn two. The match officials are from Portugal; the referee is Manuel De Sousa. The 41-year-old De Sousa has been a referee since 2000 and has had his FIFA badge since 2006, but this is just his 10th UEFA Champions League match. This is the first time he has worked an Arsenal match. He worked one Basel match way back in July of 2006 (given the timing, it's possible, though I have not confirmed it, that that was his first international club fixture.) That was a 3-1 win over Tobol Kostanay of Kazakhstan in the first qualifying round of the Europa League. English clubs are unbeaten in matches De Sousa has worked, all of which came in the Europa League. That includes a 2010 Manchester City win over Timişoara, two Spurs wins (over Rubin Kazan and Limassol,) Lan Everton draw with Lille and, later in that same season, a win for the Toffees in Switzerland against Young Boys. While I usually just list the fixtures in this section, I feel it's important on matchday six to actually discuss the different permutations of who can advance from each group. Groups A through D finish tonight, while E through H finish tomorrow, and obviously, we've discussed Arsenal's Group A already. In Group B, Dynamo Kyiv are already eliminated, but the top two slots are up for grabs. Napoli and Benfica each have eight points, but third-place Beşiktaş have seven. They'll play in Kiev knowing a win will see them through because Napoli and Benfica can't both reach 10 points while playing each other. Those sides will meet in Lisbon. Group C is completely decided already. Barcelona have won the group on 12 points and Manchester City have advanced from second place with eight. Borussia Mönchengladbach will drop to the Europa League from third place while Celtic are out. City will host Celtic at the Etihad while Barcelona host the Germans, though both matches are dead rubber. Group D isn't very interesting either. Atlético Madrid travels to Germany to face Bayern Munich, but the Spanish side, who knocked the Germans out of last year's competition, have clinched first place while Bayern are locked in second. PSV Eindhoven hosts Rostov and the Dutch side needs a win to usurp the Russians for third. From Group E, Monaco have won the group and Bayer Leverkusen is locked in second. The only question here is whether Spurs drop out of Europe entirely, which I think we should all root against because, hey, fixture congestion. Tottenham are only one point clear of CSKA Moscow for third place with the London side hosting the Russians at Wembley tomorrow. Monaco travel to Germany for the final match, but they lead Leverkusen by four points. Group F looks to have an enthralling finish as Borussia Dortmund travel to Spain to face Real Madrid. Dortmund are currently two points clear and a draw will see them win the group, at which point a second-place Arsenal will be guaranteed to face them... or Barcelona. You can bet Madrid are coming in with some confidence after nicking a late draw from El Clásico at the weekend, but Dortmund hit four past Gladbach themselves on Saturday. I think you have to bet on Madrid at the Bernabéu, though, since Dortmund have struggled on the road this year, winning only twice in the Bundesliga away from Westfalenstadion. Sporting are two points clear of Legia Warsaw for third; those clubs will meet in Poland. Leicester City have clinched Group G while Porto and Copenhagen will battle for second; Club Brugge are dead last with zero points. Porto will host Leicester while Copenhagen travel to Bruges; the Portuguese side have a two point lead over the Danes, but Copenhagen have the tiebreaker, so a draw for Porto is insufficient to clinch. In Group H, Juventus have advanced but not necessarily won the group; Sevilla are currently in second, one point back of the Italians. Lyon are in third and are three points back of Sevilla, but since they could still win the tiebreaker, they are not eliminated. That's because Lyon host Sevilla tomorrow. Sevilla won their home tie against Lyon 1-0, so Lyon need to win by two to advance. Juventus, who could still fall to second themselves, host Dinamo Zagreb, who have zero points. John Painting is a contributing writer to the Modern Gooner and a disaster thriller novel. You can follow him on Twitter @zorrocat for each scintillating twist and turn.